What keywords are associated with my FCS files? What does my compensation matrix look like? FlowJo vX lets you quickly assess this information and more with the Inspect tool. 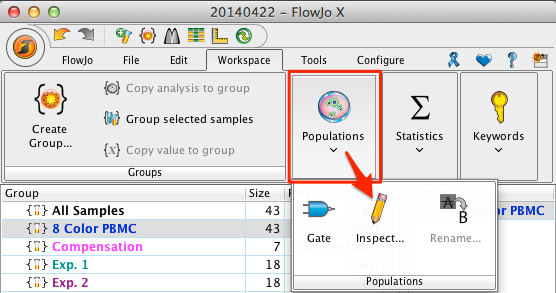 You can access Sample Properties/Information by selecting a sample in the Workspace and choosing Inspect from the Populations band of the Workspace task in the Workspace, command-clicking/ right-clicking on a sample and choosing Inspect, or by double clicking on the circle badge to the left of a sample in the Workspace (dialog shown below). This dialog provides an quick and simple way to view sample properties and verify keyword or parameter values of interest. The Inspect dialog FCS keyword header values for the sample you selected in the Workspace (1), the compensation matrix associated with the file (2), parameter, stain and display information (3) and sample quality check histograms for each parameter (4). Use the arrow buttons at the top right of the dialog to cycle through your samples. Sample keyword list – this list will show all keywords associated with your the samples, as created in FlowJo or at the time of acquisition. For more on fcs keywords, go here. 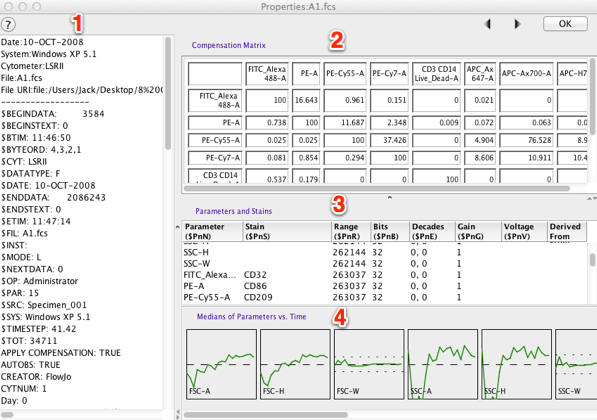 Compensation matrix – if there is compensation applied to your sample, the matrix values will be displayed here. Learn more about compensation here. Parameters and Stains – this area can be helpful for getting a snapshot of what parameters exist, their associated staining protocols and relevant information. This area is often helpful for troubleshooting data files when looking at transform or range issues. Sample quality check/histograms – FlowJo plots the median light intensity values for each parameter over time. A set of dotted lines delineates a boundary 2 standard deviations away from the median. If voltages were changed, a blockage occurred, or problems with the laser were encountered during acquisition, these graphs will help you identify which parameters were affected, when, the duration, and how severely the data could potentially be skewed. To learn how to do add keywords within FlowJo click here. To learn how to add additional parameters, click here. While these keywords and parameters do not become part of the FCS file itself, they will stay available within the workspace. They can be written into a FCS file that FlowJo will create for you by using the Export/Concatenate function. Flow Cytometry files follow an international standard format called FCS. FCS files are composed of two sets of information: 1) fluorescence and scatter values for each event and, 2) keyword values describing the sample. FCS keywords hold descriptions of the sample such as the Date, Time, Cytometer, Antibody, Parameter etc. These keywords are written in code, starting with the dollar sign (eg, Date is $DATE). Click here to view a short description of commonly used FCS keywords. For information about how FlowJo handles FCS files, go here.